Where did thousands of dollars worth of energy drinks go? They're in this trailer, the FBI says. Law enforcement found the truck, but the trailer and its stamina-increasing cargo still are missing. TAMPA, Fla. — Where did thousands of dollars worth of energy drinks go? The FBI is kicking in a couple thousand dollars if any information leads to their finding. Someone swiped a semi-truck and its trailer during the overnight hours of Feb. 2-3 in the area of East Broadway Avenue and 50th Street in Tampa, according to a news release. 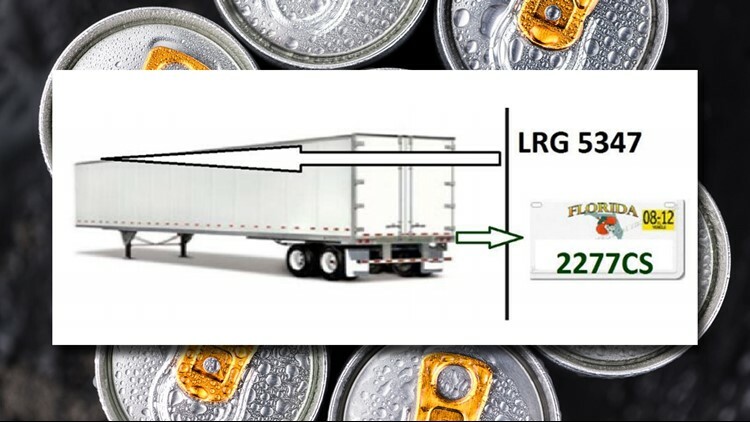 The FBI says the cargo contained some $65,000 worth of energy drinks. Authorities found the truck in Broward County, Florida, but the trailer and beverages are nowhere to be found. The trailer has an identification number of LRG #5347 with Florida tag 2277CS. Anyone with information is asked to call the FBI Tampa field office at 813-253-1000 or send a tip to tips.fbi.gov, with the $2,000 reward offered.